Although I can't 100% confirm it yet, it looks like both the Macross VF-X2 Complete Official Strategy File book and the VF-X2 soundtrack CD have had their release dates delayed until sometime in October. 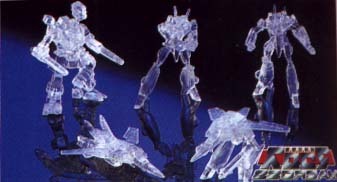 Bandai will release a clear version of the HG Mission # 1 figure set in December (picture attached). The painted version that I mentioned in newsletter # 4 is scheduled for release in October.